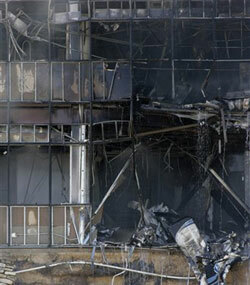 Charred remains of IRS office in Austin. This article originally appeared in Tax Notes, a publication of Tax Analysts. Vernon Hunter served two tours of duty in Vietnam, raised a solid family, and, according to family and coworkers, had he not been killed when a tax denier flew his plane into an IRS office building in Austin, Texas, the 68-year-old collections manager would have rushed to save others without regard for his own life. Go to the Internet, however, and the person you will see hailed as a hero by his family and a patriot by his fellow tax deniers is Joseph A. Stack III, who never served, who set his home ablaze, and then used his personal airplane to murder as many IRS workers as he could because of his rage against taxes generally, and in particular, a 1986 tax favor for IBM. Stack’s daughter, on ABC, called her father a “hero,” a word she later took back. But she made clear that she, too, is angry at the American tax system, although she inexplicably now lives, of all places, in heavily taxed Norway. Mainstream news organizations’ comment sites allow posts in which Hunter is labeled a “traitor,” and worse, by people who hurl invective from the cowardly anonymity of noms d’Internet. "Old Joe also killed an innocent person in that building. Allegedly, that fatality was an IRS employee. Hooray. Old Joe did the ‘mission accomplished’ his way." The February 18 crash quickly faded from the news — treated as the deadly actions of a lunatic rather than what it really was: an early warning sign of deep trouble in America, a trouble rooted in Congress’s abuse of its power to tax. The important aspects of the story that have been left out by the mainstream media relate to how corrupt tax law writing has become; how Congress impedes the free markets by creating an unlevel playing field; how it fails to adjust our tax laws in the face of relentless economic change, causing the grease that taxes provided the old economy to become sand in the gears of the new economy. And in this matter, Congress took away some economic liberties from software programmers and the like, as Stack asserted in his suicide manifesto. This all began a quarter-century ago with a fight between two segments of the information technology (IT) industry that IBM exploited to shave what in IBM’s operation is a thin sliver off its tax bill. In American criminal law, we hold anyone who sets a felony in motion responsible for the outcome, even if it was the death of someone they never saw coming, from a weapon they never knew about, including when a cop fires the only shot while trying to stop the crime. IBM did not commit any felony or break any law, but it did set in motion the events that left Hunter dead, and as a political and social matter, we can reasonably hold it accountable for the unexpected consequences of its actions. In his manifesto, Stack cited section 1706 of the Tax Reform Act of 1986 as partially motivating his deadly attack. He named former Sen. Daniel Patrick Moynihan, who sponsored the law, although Stack wrote nothing about how Moynihan tried unsuccessfully for years to get the law undone. Section 1706 singles out IT industry job brokers, denying them safe harbor under section 530 for hiring independent contractors. The job shops fell into two types: those that placed people who were their employees in temporary posts at companies needing IT work, and those that placed independent contractors. The issue here was neither cheating people out of benefits nor cheating the government out of taxes. The issue instead was one group seeking an unlevel playing field. No hearings were held. Section 1706 was a last-minute addition to the 1986 act. The Joint Committee on Taxation staff projected the section as producing $60 million over five years because of assumed reduction in tax cheating by programmers who were independent contractors. And $60 million of tax savings was what IBM wanted but could not get except for an offsetting increase in someone else’s taxes. Moynihan was eager to cater to IBM, a powerful economic force in his state, unlike the independent contractor programmers onto whom the tax burden was shifted. The reaction from major companies was swift and sure. Dozens of them — from IBM to Nissan, from Clorox to Wachovia Bank, from AT&T to TRW — simply decided that any temporary programming work would be done only through those job shops that used the employment model. For people like Midge Johnson, who had set up an independent contractor job shop in Lanham, Md., the bill destroyed her business. Those programmers who wanted to hire out on contract were devastated. Jim Carlin, a partner at the accounting firm Holthouse Carlin & Van Trigt LLP, the largest in Southern California, said the IRS was determined when it audited one job shop with 50 employees a few years after section 1706 was enacted and signed by President Reagan. The audit took more than eight months to resolve and was a costly drain on the client, although Carlin prevailed. Had the firm lost the audit, it might have been forced to go out of business, he said. By then Moynihan had changed his mind and proposed repealing the law. At one point nearly 70 senators, from Edward M. Kennedy to Jesse R. Helms, signed a letter favoring repeal. A new study found that software programmers cheat less than most taxpayers. This should not be surprising given that complex lines of detail do not daunt programmers. Harvey J. Shulman, the tax lawyer who represented the National Association of Computer Consultant Businesses, then arranged something remarkable. He got his clients, the job shops using independent contractors, to agree to withholding for their independent contractors. If we had withholding for independent contractors, we could sharply reduce Schedule C tax cheating in the area, cheating that involves the largest number of people, according to National Taxpayer Advocate Nina Olson. And with a withholding regime, we could give those programmers who want to work as independent contractors the freedom to organize their affairs as they choose. These programmers say that as independents, they have incentives to hone their skills and stay on the cutting edge, while companies that hire them as workers use up their current skills without investing in constant training. Thus, does the tax law affecting employment diminish their lifetime incomes and wealth building? So what came of this breakthrough on withholding pioneered by the independent contractor wing of the job shop industry for IT workers? The 20,000 members of the Black Data Processing Associates also wanted the law repealed so members would be free to choose whether to be employees or independent contractors. Earl Pace of Philadelphia, the organization’s founder, said it will support withholding to get the freedom to be independent contractors. The net result of this law is that Congress has taken away the economic freedom of one group of people, IT workers, to be independent contractors. Had this law been applied to freelance writers and artists, it would have been repealed quickly — and indeed, when an onerous tax rule hit those workers two decades back, their ability to articulate their complaints helped bring about speedy repeal. So why is this law still on the books? And why was an offer to withhold ignored? In part it was because there are no political donations to be had — at least not in big numbers — from self-employed computer programmers. And in part it was because of an inflexible ideology that makes tax a vile four-letter word in Washington. So people like Johnson have their economic liberties taken away just so that IBM can shave a million bucks a month off its tax bill. With more than $100 billion of revenue in some years, the tax savings is a minor benefit. Yet IBM was too greedy, or cheap, to pay its full taxes — and on overseas business no less — and it gained by forcing people like Johnson to bear its burden. Then along comes Stack, who long ago got lured into crazy ideas like having his house declared a church in the mistaken belief that this would let him escape taxes, and to whom section 1706 is a powerful excuse for his own immaturity and failures. But maybe he is not so different from some in Congress, or IBM, in failing to take responsibility for his own choices and the consequences, expected or not, of his actions. Kidd, the tax denier, lives in a far-out world where a few facts and a lot of fantasies form an inchoate stew of half-baked ideas. But she got one thing right about Stack’s use of his airplane as a tax protest tool. She wrote that the crash “won’t change one single IRS regulation” and noted that Congress, not the IRS, writes the tax laws. Kidd at least understands that Congress makes the tax laws, making Stack’s protest not just murderous but misdirected. A government without a tax agency? Nowhere in the history of the world has any government existed without a tax agency, not even thousands of years ago in ancient Sumer. Did King sleep through junior high school civics? King seems as deluded as Kidd and the paranoid conspiracy promoters whose Web sites report that Austin firetrucks were at the IRS building waiting because Stack crashed his plane as part of a government plot to discredit the tax denier movement. Like Stack, the lawmaker rejects personal responsibility for a problem that he helped to create — the abject failure of our Congress to adjust our tax laws so they flow with the changing economic order, not against it. Congress needs to recognize that the whole landscape of work is changing. That means employer-based health-care and retirement benefits are fast slipping away and work is becoming temporary for tens of millions, yet the need for healthcare and retirement benefits is growing. Congress needs to recognize that the changing nature of employment requires a complete overhaul of the tax system as it relates to compensation for services, including a withholding regime that is applied to independent contractors consistent with their net earnings. One of the tax committees ought to have Shulman in to testify about withholding for independent contractors and ask the logical question: Why not apply withholding to all independent contractors, as Olson has proposed? And what is IBM’s duty here? It would be easy for it to just dismiss its role in this. But IBM is a company that spends a lot of money on polishing its image, asserting that it is a model of a responsible company. The death of Hunter gives it an opportunity to put its actions where its self-promotion is. Samuel J. Palmisano, CEO of IBM, could take a lesson here from the executives at Toyota, who sought a different kind of government favor when they asked vehicle regulators to hold off on recalling cars that accelerated suddenly, killing at least five people in 13 crashes. Toyota executives apologized to the public for their conduct, asked people to forgive them and their company, and promised to do the right thing. IBM could start by donating some of its ill-gotten tax savings to a scholarship fund in the honor of Vernon Hunter. But more significantly, Palmisano could perform a great public service by declaring that IBM will take no more benefits from its 1986 tax deal and pledge to never again allow its name to be sullied by shifting its burdens onto any other identifiable group of taxpayers, as clearly it did with section 1706. Then Palmisano could direct IBM’s Washington lobbyists to make repeal of section 1706 their top priority and to loudly, publicly work for its repeal until that happens. In so doing, IBM could open the door to a new tax debate that could help stop our long, slow economic slide by moving us to a dialogue based not on ideology and favors, but on the crucial central role of how to make the tax system serve commerce while providing the revenue needed to run government and protect the liberties of the people. So what will it be, Mr. Palmisano? Is IBM just about greedily taking whatever it can extract from Congress and the likes of Midge Johnson and other honest small-business owners in IT? Does IBM recognize that it made a mistake in 1986 — one small mistake that is part of a larger culture of tax favors for the powerful and well connected, and that is damaging the economy while robbing IT workers of some of their liberty and driving some people crazy? One of them so crazy that he murdered Vernon Hunter. This is an opportunity for IBM to do right and provide a benefit to the long-term welfare of our country by focusing on the welfare of the society that makes IBM’s success possible. When Thomas J. Watson, in 1914, joined the company that became IBM and that he (and later his son) led to success, he wrote a famous memo that goes to the heart of what Palmisano can and should do in the face of Hunter’s murder. That memo has been reduced to a single word that hangs in IBM offices around the world. Ponder, Mr. Palmisano, what effect IBM’s accepting this tax favor has done, how the unintended consequences of IBM’s actions produced an awful result. Ponder what so many similar actions by your company and others are doing to America and how much better off the whole country could be if leaders like you called for an end to these deals and for a serious debate about how to make taxes serve us so that America will endure. As Thomas Watson taught you: Think. Your thoughts? E-mail me at JohnstonsTake@tax.org. I think IBM has a fiduciary duty to maximize profits, that would not gel with lobbying to pay more in taxes.